Chuck Klosterman has an undeniable talent to make something trivial matter. Take his borderline obsession with KISS or how he can take the minutiae of pop culture (both well-known and obscure) and weave essay after essay about how everything is interconnected. He’s Dirk Gently for the Gen-X generation. With better fashion choices. It’s easy to identify with his chucklesome tirades and there is this bit in IV where he probably scratched his beard and thought “hang on a second… I could so write a novel! Just after Ren & Stimpy but before Blossom”. So he left for a Dr. Pepper, missed a call from Mayor McCheese and went to do a novel that isn’t a novel, a story that tells no story nor ties all its threads and characters that are more like different personalities trapped inside his head, buried beneath memories of eating Frankenberry while watching a very special episode of Diff’rent Strokes (stupid Gooch). So, after reading “You tell me”, a piece of short fiction in his book IV, I wondered if this pop culture-savvy wordsmith would try again to write fiction. Flashforward a few years and, waddayaknow? 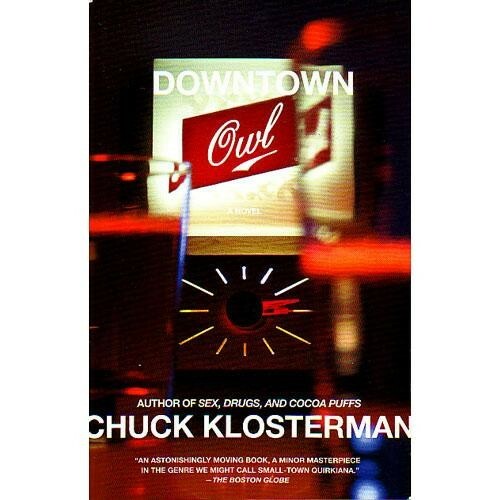 Downtown owl, by Chuck Klosterman. Set in Smalltown, (actually: the fictitious town of Owl) in North Dakota, Downtown Owl looks at the intertwined lives of three dissimilar characters: Horace, a widower who spends most of his days drinking coffee with his buddies and pondering about conspiracy theories that he has heard; Mitch, an underachiever and underlooked genius that never seems to get a chance to do right and Julia, a new arrival to town that will teach some middling courses in Mitch’s school (while boozing herself to oblivion in the local dive bars). The town of Owl is perfectly defined by Klosterman. It reeks of your little one horse town (we would call it pueblo chico in Mexico) where fads might not even reach the place and where everyone knows each other (there’s a hilarious bit about the origin of some nicknames in Owl). Usual conversations veer between past football championships, an oversexed Phys Ed teacher who would make Roman Polanski proud and a trio of brothers that are the local heroes (football legends, of course). Chapters are narrated, but some of the stream-of-consciousness flowing through the characters is perfectly retold to us, the reader, by some clever prose. We are treated to superb, funny dialogue like: what each student is thinking while a teacher babbles on George Orwell, the “what he/she said and what he/she meant” thing we all know happens when two persons fancy each other and what do taxes mean to an elder person (and his skewed view on social class). There are a few criticisms floating online and although some of them have a valid point to make (especially regarding the ending), the “collection of short stories” is the one that baffles me. Sure, the characters really don’t cross paths too often (I can’t honestly recall if they ever do!) but it’s this slice of life subject and manner of writing what really gives each character get a proper persona defined. Of course, all characters seem to talk like you’d expect Chuck Klosterman to speak, but that’s a good thing about novels: the writer can try different voices for his own thoughts and see how they play out. Not everyone speaks like a Chuck Klosterman character, but that’s the beauty of it: it gives a novel an identity instead of being a disposable plot boiler. Give me Horace or Julia anyday over Dan Brown‘s latest avatar. Now, the tricky bit is the ending. All books (except Bret Easton Ellis‘ Rules of Attraction) always gear towards an ending, with different results (Stephen King is master of the crap ending). Without spoiling it for you, I’m just gonna say that the ending of Downtown owl is very polarising. I didn’t like it at first. I actually felt cheated. Too many strands felt loose, like a destroyed sweater hanging from the branches of an old tree. There’s even a short newspaper cutting that seems to rub it in our faces. After a few moments of reflection and a couple of pints with my parents, I think I nailed what was my problem with the ending: whereas the characters and the setting feel dreamlike, the ending is very, very harsh and realistic. It’s a reflection of the fickleness of fame: how some will get the kudos while the deserving will pass unnoticed. Posted in Book review, reviewsTagged Chuck Klosterman, Downtown Owl, NavelgazingBookmark the permalink.